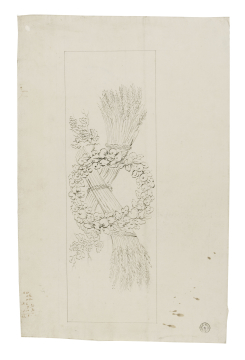 Record drawing of a decorative rectangular panel showing two tied sheaves of wheat overlaid by a wreath with vine leaf sprigs. You are here: CollectionsOnline / Record drawing of a decorative rectangular panel showing two tied sheaves of wheat overlaid by a wreath with vine leaf sprigs. Unfinished study in black chalk showing a decorative panel with classical head in profile and swags; it is a sketch for the composition in Adam vol.26/162, and is in a similar hand. The draughtsmanship here is very close to that of the ink sketch in Adam vol.26/156.